Week 3 of the programme draws to a close, and despite the lean times in the station for time off, I still managed to get in a couple of swims. Wednesday was a bike session in the gym, and those are not terribly exciting. I took Thursday off, and then hit the pool on Friday morning. Someone had let a dolphin loose in the next-but-one lane. I am going to pretend the lady was an Irish Olympian, just to salve the wounded pride. Suffice to say, it was fascinating to marvel at all the wonderful strokes as she glided up and down the pool. At one point, I did my best front crawl and managed to keep up with her for one length, though I should probably add she was on her back and only doing leg kicks. Oh well. Back to the doggy paddle for me. I’ll never be a decent swimmer, but I don’t have to be, I guess; just good enough to get through the 3.85 kms next year. Yesterday was a longish run, so into the Park and a bit of a loop. The standard ‘past the beech tree’ and into the woods, and on out beyond the sluice, and then the top path. Weekends are always busy in the Park, and one must pay particular attention to small dogs on extendable leads. There is an etiquette to this, and we all share the paths and so must be considerate to all. Mind you, there’s nothing worse than coming across the slow walker on a narrow woodland path, with a dog in tow, and realising they are listening to music on their headphones. When you reach a wider spot and make a lunge past them, they suddenly leap out of their skin as if they had just been shot. It’s a little unnerving. Word to the walkers: please consider other park users; if you can’t hear people behind you, how are they going to get past without scaring the bejaysus out of you? The Liffey in the Park. 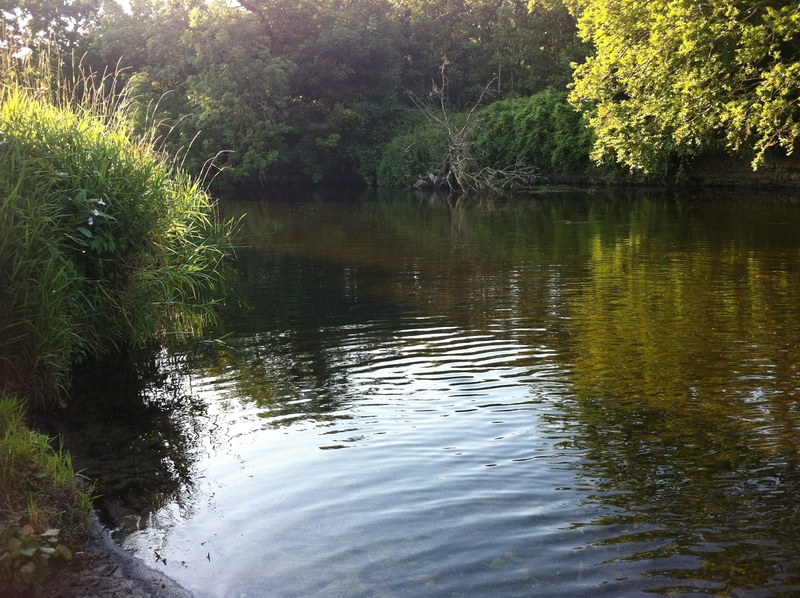 Very shallow at this time of year, which cannot be good for the overall health of the river. Out past the ranger’s station and then a loop back by the dog park and down the winding hill near the ruined church. The teasels are all flowering now, and they are quite a sight. Over the bridge and down by the river. Legs vaguely curious how this whole Iron Man project is going to pan out. Too much thinking, legs, and not enough running. Musn’t dawdle. Mustn’t grumble. A heron is sitting in an alder overlooking the weir, preening its rather untidy plumage. Most of the time, this side of the weir is shallow and still, as the water runs the far side, through the ever-open sluice. Here in the shallow ponds, we once found an enormous trout, trapped by the receding waters of the Liffey. We must have been 10 or 11. I recall there were three of us there, after school. We tried in vain to catch that trout, though we had no rods or nets. It evaded capture all afternoon, and we ran out of time, as one of us, Ronan, was supposed to be home by six. I remember he landed himself in trouble with his mother. He protested, and tried vainly to explain the wonders of this giant fish, and our heroic escapades. All came to nought, and he was roundly admonished. I’m not sure what we would have done with it had we caught it; looking back there was probably little chance of that happening. I’ve had an admiration (and fascination) for trout ever since. 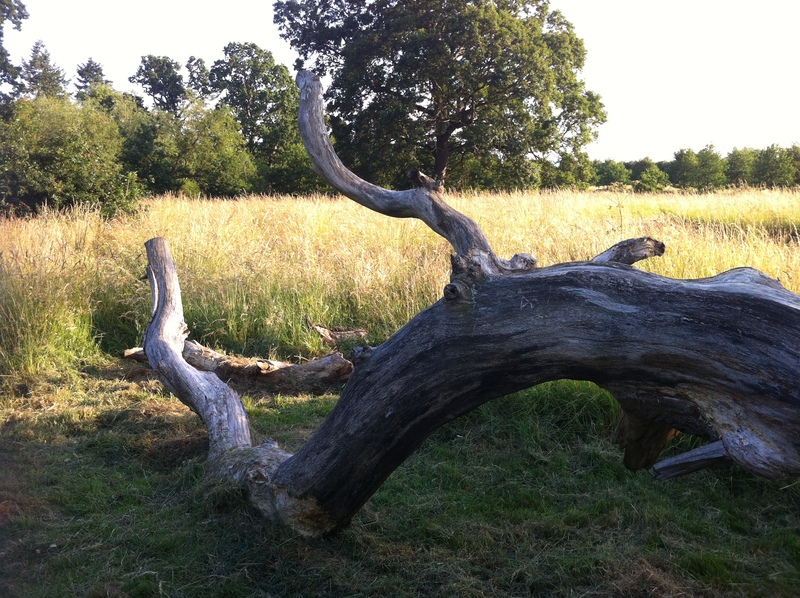 Auroch or Mastodon… the Wild Beast of St. Catherine’s Park. Out onto the pitches and loop around to the ranger’s station once more and on the home leg now. The weather is heavy, and the sweat is copious. Home in an hour and eighteen minutes. That’ll do for now. Today we are back in the gym on the bike. That should easy, after watching Stage 20 of the Tour de France on Alpe d’Huez yesterday, and the gargantuan efforts of Nairo Quintana to cut the deficit and grab the yellow jersey at the death. And he wasn’t far off either. But lest you think I am some seasoned pro who can rattle off these names like long, lost brothers, I will confess I am a very late convert to cycling. And for all my love of getting out on the bike, I still reckon triathlons are somewhat biased in favour of the strong cyclist. But that’s just me, and that’s just too bad. I don’t have a strong discipline per se; more like two weak ones, and an okay one. But mustn’t dawdle. Mustn’t grumble! An hour on the bike and yet another precision cycle as I clock up 30kms in 60 minutes and 25 seconds. 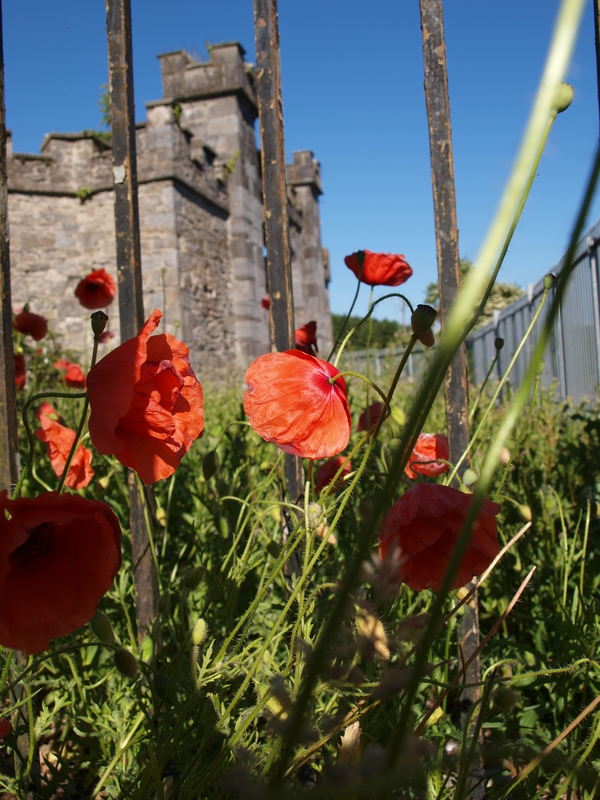 Poppies at the gate designed by Francis Johnston, the same gent who designed the GPO in Dublin. Finished off the bike session with some strength and conditioning. There is no set programme for this as of yet, or, to be fair, there is, but I have yet to implement it. Instead I did some bench presses, sit-ups, pull-downs and clean and clears. 20 of each, 3 times, all with fairly moderate weights, just to get started. I will try and build in two gym sessions each week from now until race day, and will detail what I am actually doing. If you are not sure what the individual exercises are, hit Google, and all will be explained. YouTube is also great for showing you what each discipline is in the gym. I’m no gym bunny. I’d much rather be out and about, running, cycling or swimming. But I can see the benefits of some gym work. It’s not my triceps, biceps or abs that need convincing, it’s my brain.